Fifteen years is a long time but the Mahindra Scorpio indeed continues to be the manufacturer's most popular SUV since its 2002 launch. Its biggest appeal lies in the fact that in a world where crossovers are jostling for space the Scorpio is still a hard-core, old-school SUV. The second generation Scorpio was launched in 2014 which has only helped its fan base grow stronger, as apart from being a butch SUV the Scorpio is now also a more comfortable, plusher family vehicle. And while I personally didn't think the Scorpio was beginning to look dated, I cannot deny it could have done with some more power. 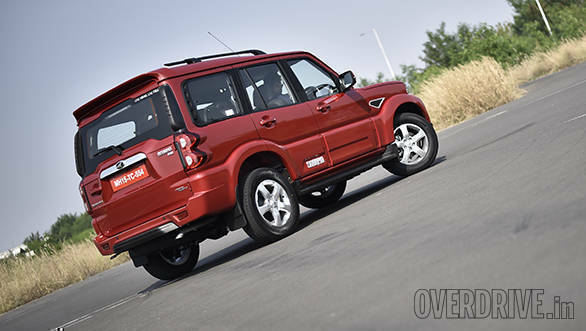 Mahindra has just addressed the issue while also sprucing up the Scorpio's looks. I was hugely impressed by the new Scorpio's front end when it came out in 2014, particularly with the fangs on its grille. The fangs are gone now and have been replaced by a simpler looking 7-slat grille that leans more towards a 'family' look. The headlights, front bumper and skid plate get mild design changes as well while the fog lamps now get a chrome housing. Changes to the front end are thus not too extensive, though the difference can be noticed immediately particularly thanks to the new grille. The intake continues to take its place of pride on the hood, and certainly adds to the macho appeal. The roof rails are exactly the same, and continue to look very appealing. Changes to the rear include a redesigned tail gate, though again the changes are just about enough to distinguish the refreshed version from the older one. Of course, current owners will be quick to notice the change in the contours, even though the new design continues with sharp edges which is a good thing in our books. The tail lights get minor revisions as well, as do the aero vents on either side of the rear windscreen. Changes inside are limited to revised upholstery and a leather wrapped steering wheel and gear lever. That said, I would have liked a bigger touchscreen unit as it is the same as before. The screen's positioning could have been revised as part of the current update as well. The Scorpio now gets a reverse parking camera and while the resolution is good, using the display is a chore given its low placement, particularly in harsh light. I would have also liked some more space on the driver side door panel, as there's a nice indent for the arm when in the driver's seat but the space between the indent and the window sill isn't enough to move your arm freely. The biggest changes are under the hood though. The Scorpio's 2200cc, inline four cylinder, mHawk engine gets a new Borg Warner turbocharger that has helped in bumping power and torque figures up. The new Scorpio now offers 140PS produced at 3750rpm now as opposed to 120PS produced at 4000rpm earlier. Peak torque produced stands at 320Nm, offered from just 1500rpm as compared to the 280Nm produced 1800rpm onwards earlier. Variants have also been changed, and engines and performance will vary variant wise. The base S3 variant will use the 2.5-litre m2DICR engine producing 75PS, while the S5 and S7 variants will get the mHawk in the same state of tune as before, offering 120PS and 280Nm. The S7 will also be offered in the 140PS trim though, along with the new top of the line variant, the S11. The more powerful S7 and the S11 also get the brand-new 6-speed gearbox, while lower variants will continue using the same 5-speed gearbox as before. We only drove the S11 briefly at Mahindra's own test track, and the differences in performances were noticeable instantly. 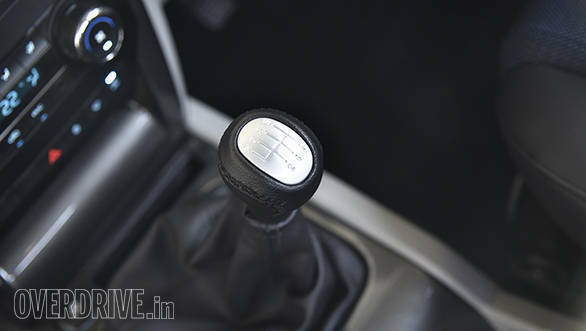 The new gearbox comes with a self-adjusting clutch that Mahindra claims will offer consistent feel without calling for more effort over extended usage. The clutch pedal indeed called for very little effort while gear changes were more positive sans the older unit's rubbery feel. While the reduced clutch effort should make for more comfortable drives in traffic, the positive shifts should offer a more engaging feel. The revised VGT makes for a sprightlier feel as soon as you start moving, as peak torque is now available earlier. The punchy feel continues as revs go up and power delivery is linear with a consistent surge beyond 3000rpm. We couldn't test the new Scorpio for acceleration, but I am certain it will post noticeably quicker 0-100kmph times in a VBOX test. 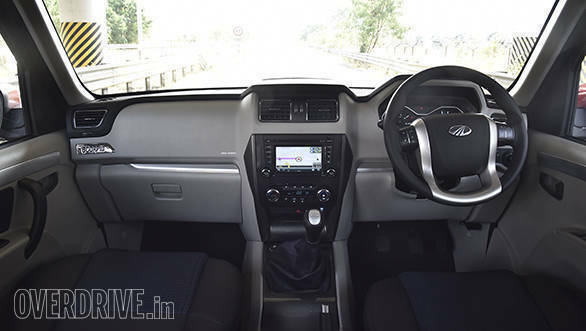 The engine also feels calmer with lesser vibration, while NVH levels are better, making for a quieter in-cabin experience even at above 100kmph. Of course, having an additional gear helps matter, as the engine is revving lower now at say 100kmph, which should also improve fuel efficiency over longer drives. 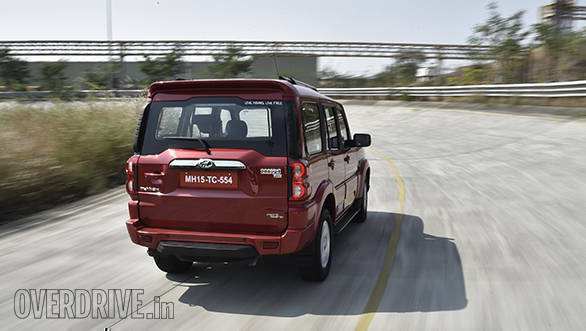 The Scorpio continues to use Mahindra's third generation body on frame chassis that was introduced in 2014, while the suspension has been tweaked to handle the additional power. This shouldn't affect ride quality though and the new Scorpio offered a good ride on the test track which has smooth, even tarmac. The brakes have been beefed as well and the new Scorpio uses revised brake pads and new brake boosters to improve braking. On the whole, the Scorpio retains its old-school feel while feeling more modern and car-like to drive with its higher performance and new, vastly improved transmission. Better brakes are a welcome change too, while the ride quality didn't let me complain, on the test track at least. The reverse camera is a value addition though Apple CarPlay and Android Auto are not on offer just yet. 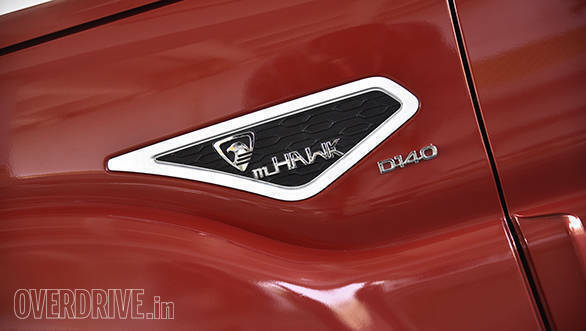 Mahindra tells us it is working on offering the connectivity though. 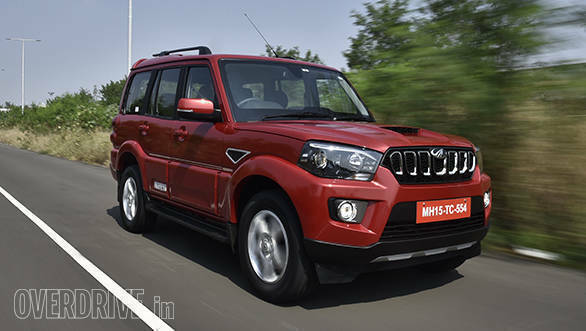 Pricing for the refreshed 2018 Mahindra Scorpio begins at Rs 9.97 lakh for the base, S3 variant and goes up to Rs 14.78 lakh (ex-showroom New Delhi) for the top of the line S11 variant you see here. Given its changes and improvements, the Scorpio, billed as one of the original Indian SUVs, continues to offer a likeable feel to those looking for an old-school SUV.